Custom shelves add beauty and organization to any room. Having a space that is up and out of the way to display items immediately enhances a home's look and functionality. At The Custom Closet Company we are skilled in assessing a space and determining the best way to add custom shelving to your home. 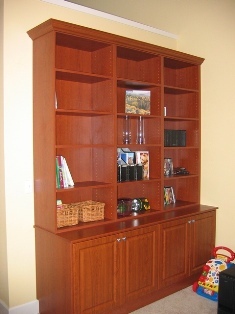 Custom shelving is an ideal solution for items that are displayed but rarely used in the home. Custom shelving can be a great way to store items in the garage. Custom shelving by The Custom Closet Company used throughout the home will add stylized display space that works for you. Interior design and installation expertise are the foundation of what make The Custom Closet Company's solutions the ones that will last for years. When we install your new custom shelving, your design will be functional and beautiful for years to come. The Custom Closet Company has been servicing the Greater Puget Sound since 1990. Call The Custom Closet Company for your free in-home estimate today! Don't hesitate call (253) 245-3883 and find out how custom shelving can change your home.